On Tuesday, 22nd March, Urban Synergy and Thomson Reuters collaborated to deliver a STEM focused Role Model Seminar to 100 year 7 and year 8 students from Conisborough College, Catford. The seminar which focused on working in the rapidly growing STEM industries is the second of its kind. 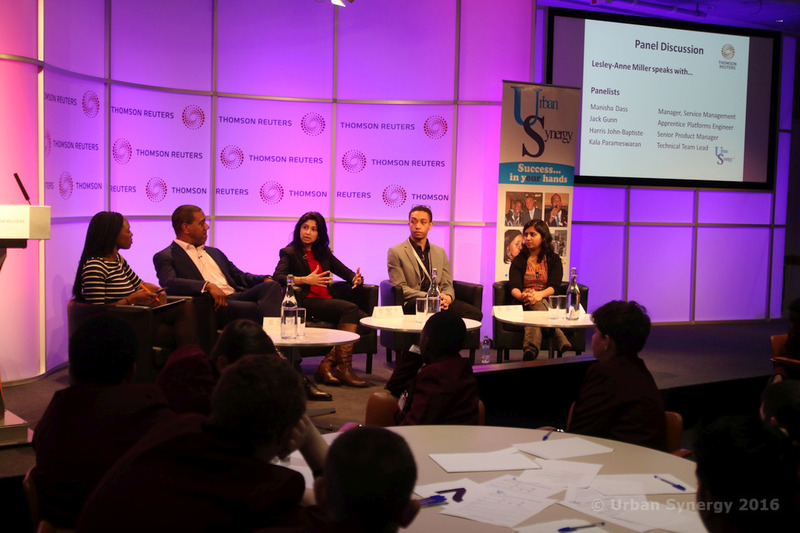 The especially tailored format created by Urban Synergy and Role Models provided by Thomson Reuters aimed to raise student aspirations by sharing information about their jobs and opening their work environment and building. There are currently three more seminars of this kind planned for 2016. The seminar was opened by Elaine Thomas – Global Head of HR for Technology at Thomson Reuters, welcomed the Urban Synergy, the students, their teachers and Thomson Reuters Role Models. Elaine gave an overview of her thoughts on technology in today’s world and her role at Thomson Reuters. In the panel session facilitated by Lesley-Anne Miller, Client Liaison at Urban Synergy, our four panelists shared about the challenges they faced and overcame, what they like most about their jobs and the many opportunities available for young people interested in the STEM sector. Following the panel discussion, students got the opportunity to ask more questions during a speed mentoring session with over 20 Thomson Reuters staff who specialise in technology. The session provided students with an in-depth insight into the potential and opportunities available for a future in the technology field. Mirlinda, 13 – “ Harris John-Baptiste gave everyone tips on how to choose what we will do and explained very well what he does. He said be passionate about what you want to do and be open minded. Leila Thomas, Founder of Urban Synergy and Technical Project Manager at Thomson Reuters was really pleased how the seminar came together in Canary Wharf.